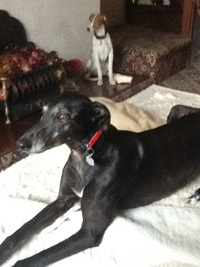 Went to her new home on Monday 12th November 2012. 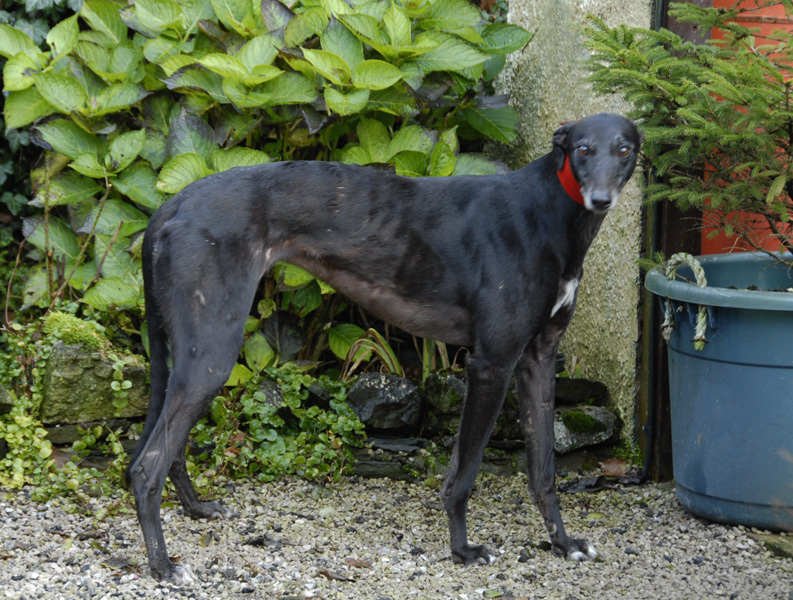 Sadly Lucky was returned in July 2013 due to a relationship breakdown. Went to her forever home a few days later, which she took to like 'a duck takes to water' . as a result of her back end going and she was unable to stand. Lucky is a lovely 6 year old black greyhound who has been living in a house for 3 years with children, four cats, a couple of terriers and a German Shepherd. 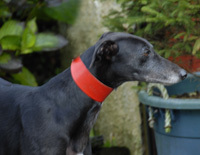 Sadly no longer able to be kept by her owner she came to us. 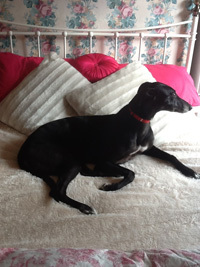 Lucky is a lovely sweet girl who is house trained, spayed and microchipped. Coming with no paperwork she will need her inoculations bringing up to date. Lucky is quite vocal when she wants something and you can have a conversation with her, which is rather funny to watch. Walks nicely on the lead and travels well in the car. 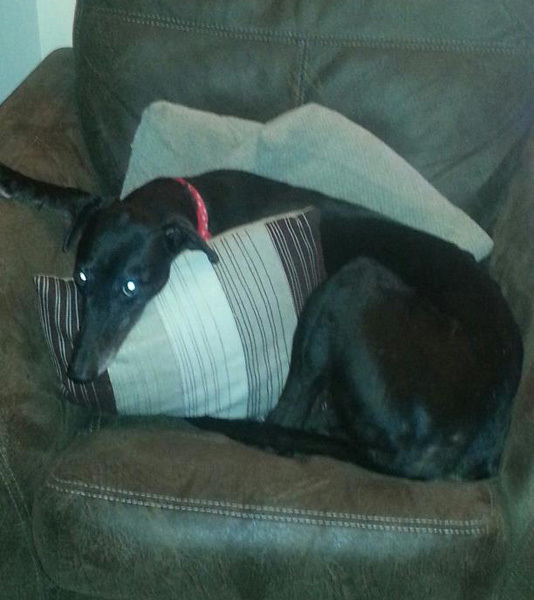 We only received the phone call last night asking if we could take Lucky because her owner could't keep her anymore. Our branch had been suggested to them because the branch of the Trust who origionally re-homed her had no spare foster places, and with her being in a home for three years thought it not fair to put her back in a kennel unless it was a dire emergency. A lady from the same area is bringing Stan here tomorrow, so we contacted her and asked if she could do a slight detour and pick up Lucky for us as well. This she kindly agreed to do. 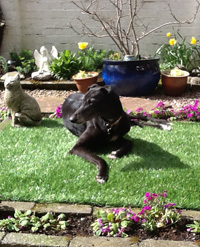 When Lucky arrived we gave her something to eat and having done her toilet in the garden she quickly settled on a dog bed in the living room. Lucky slept well last night and this morning ate her breakfast with the others. When I knew Lucky was coming in we contacted a couple who had a terrier and who were looking for a Greyhound. From Lucky's background we thought she would be perfect for them and they arranged to call in here this afternoon and have a look at her. The family having met Lucky asked if they could walk her with their Terrier to see how they got on. We muzzled Lucky as is branch policy and I joined them on the start of the walk. The terrier had a sniff of Lucky, she couldn't care less then calmly turned and had a sniff of the terrier. The body language between the pair of them was perfect, and once all the hello's were said the pair of them walked off side by side along the road. I came back and left the couple to walk them together and when they returned they asked if they could adopt her. This lunch time the couple who visited Lucky yesterday came to adopt her and take her home with them. Paperwork complete, coat and bed purchased, and off she went with them to her new home where we hope she will have a long and happy life with her new family. 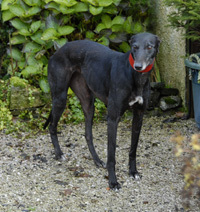 We heard later that Lucky is settling well and her new owners took them for a walk. Upon their return both her and Lady fell asleep. Lady the terrier has grumbled at Lucky once because Lucky tried pinching some food off the work surface. 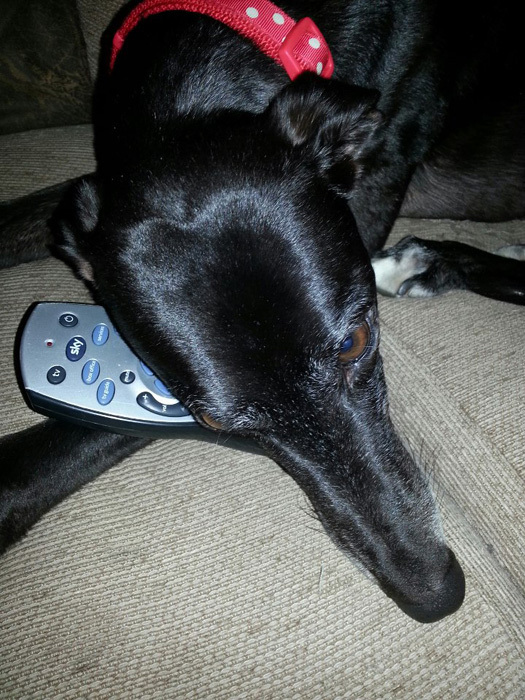 Lady, when we said 'off' to Lucky, Lady grumbled at her too. 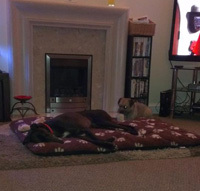 Later this evening we received a photograph of Lucky fast asleep on her new bed in the living room with Lady wondering what all the changes are! We received a photograph this evening showing Lucky looking very relaxed and all curled up on the settee in her new home. Lady's new owners took her for her second inoculation today and it was suggested she have a dental, so a quotation was reqested. We heard today that Lucky has been for her dental - she had gingivitis so the vets pulled back her gums, cleaned and did a scale and polish... all her teeth were stable in the gum so she didn't need to have any removed. 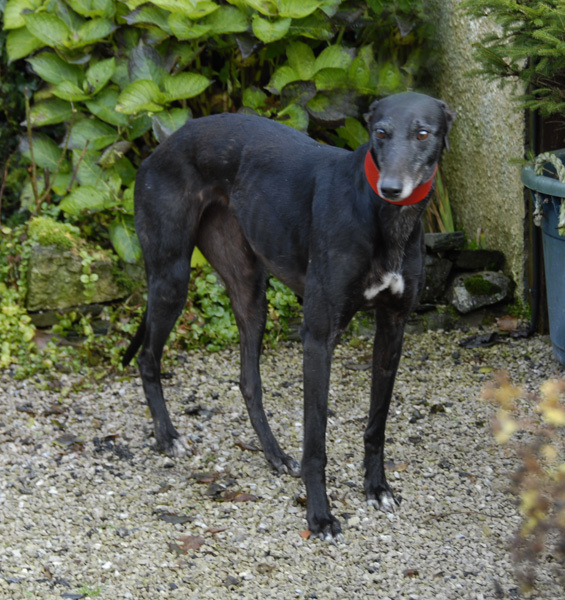 Sadly Lucky was returned to us because her owner's relationship broke down and they were splitting up. Neither were able to keep her. She was only here a few days before she was off to her forever home with an elderly lady who had just lost her greyhound to ill health, and had re-homed Ryan., However, his new home was in a town and one he was not sure of, so much so, he didn't want to leave the house until the evening when it was quieter, which proved difficult for his elderly owner. After a number of chats on the phone, it was deemed in Ryan's best interest he come back here to give him chance to settle and for us to find him a new home that was more appropriate for his shyness. Lucky was the perfect companion for Ryan's present owner so we decided to swap the dogs. It was perfect. Lucky took to her new home and owner like a 'duck to water' and Ryan, although back in the kennel when he returned here due to lack of space in the house felt much happier. 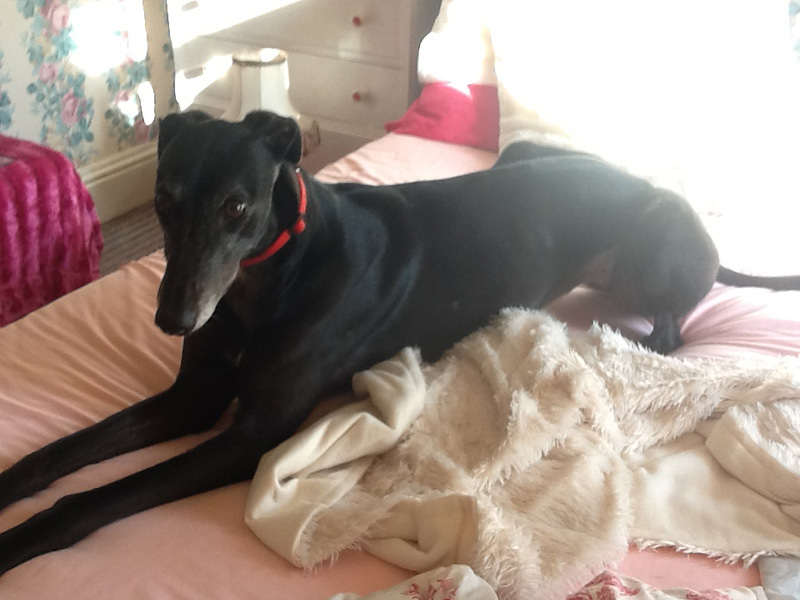 We received an email this morning from Flower who brought Ryan and his new owner here to swap him for Lucky because of the problems she'd been having over his shyness. Flower wanted to let us know they both arrived home safely. Lucky's new owner hadn't even got the key in the door, and Lucky couldn't wait to get in,she was like "well come on then, what are we waiting for". 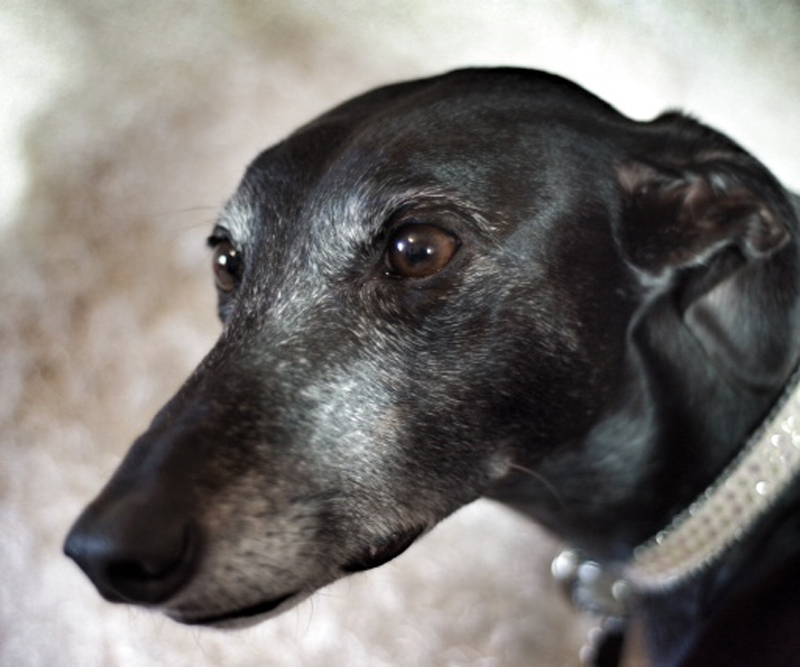 She was over the threshold before her new owner had dropped her lead and in she went as if she had always lived there. Luck and her new owner will get on fine. 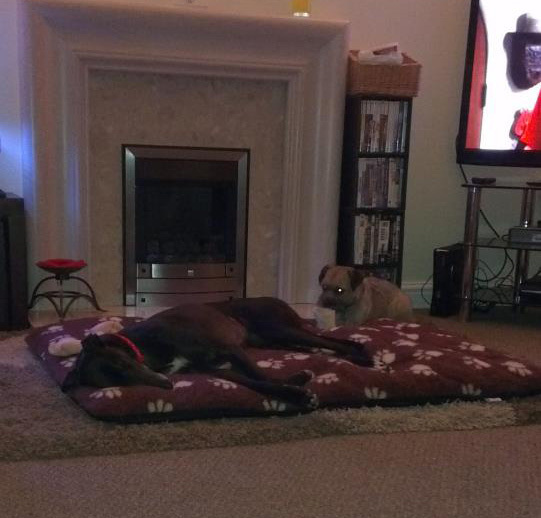 This evening we received some lovely photos by email of Lucky settling into her new home, which were super to see. Lucky's new owner is over the moon with Lucky! 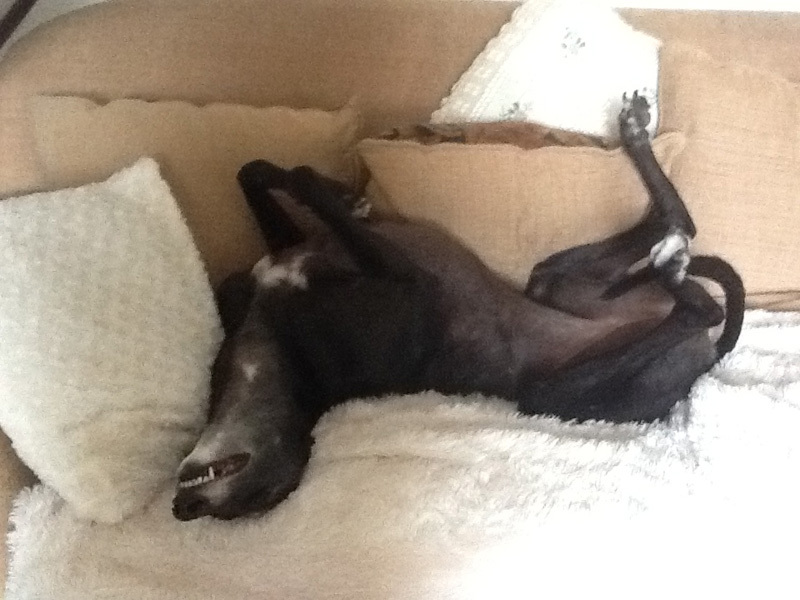 She emailed to say both her and Lucky had a good night's sleep last night. Her daughter went for a walk with them and she emailed to let us know she hasn't seen her mum so happy for ages. 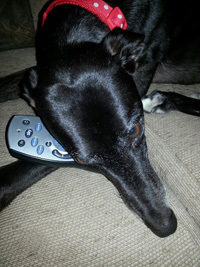 She can`t stop talking about her, she is a lovely dog and is acting like she has lived with her mum forever. when they got back from their walk they gave her some dry dog food with salmon on top! she said she loves salmon.... don`t know how she knows! We heard from Joe's owner that they all went for a walk with Lucky and her new owner last week. Joe's owners say "thats one happy little dog!" which is lovely to hear. 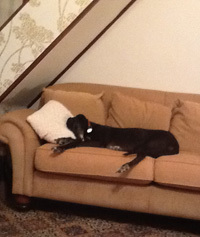 Today we received by email a photo of Lucky laying on the settee in her new home - a very happy girl! 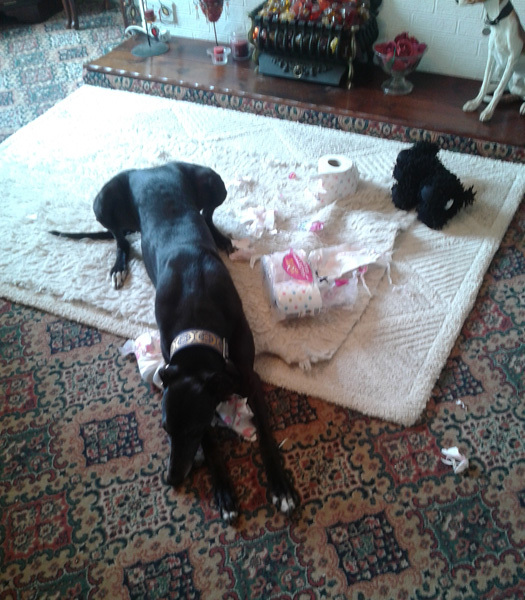 Lucky thought the packet of new toilet rolls arrived in with the shopping great fun - it reminded her of making her bed in the kennel! 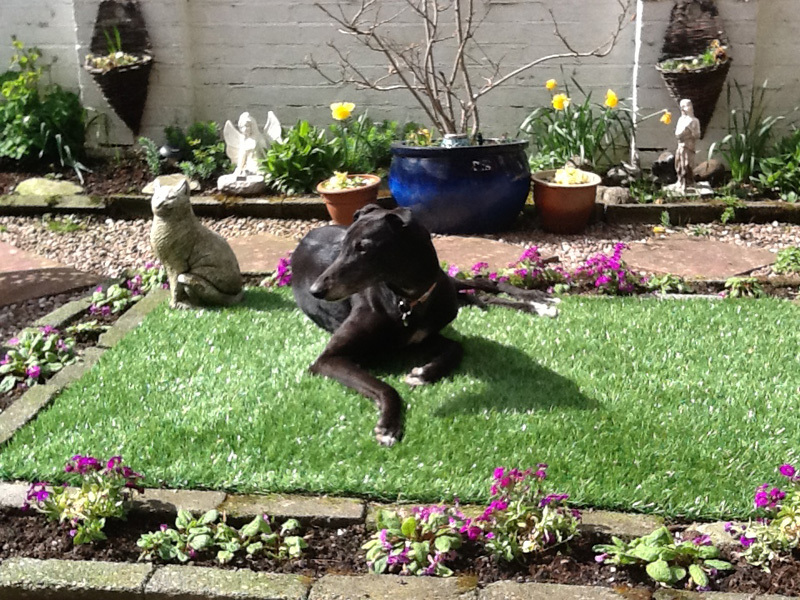 We received a lovely photo of Lucky today sitting in the garden in the sunshine - looking so well and relaxed. We received a call this evening letting us know that sadly Lucky was gently put to sleep this afternoon. She had become more weak over the past few weeks and her back end was going. Today she looked so sad and was unable to stand. Run with the angels a youngster again. Go with God our pretty gentle Lucky.